Give your bread the artisanal touch with Juvale's Banneton Proofing Basket Set. 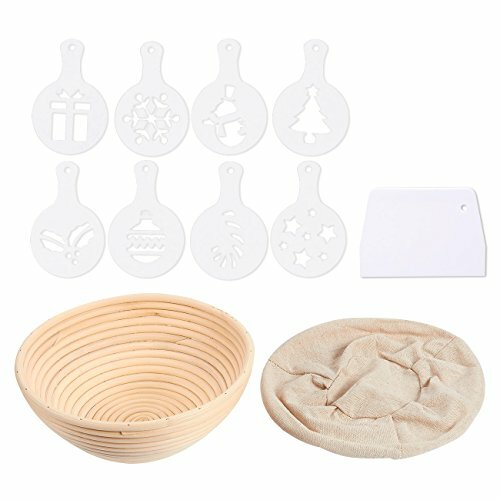 This set contains a banneton basket, a cotton liner, dough scraper, and 8 Christmas-themed baking stencils. Made of coiled rattan that draws away moisture from your dough while it is rising, this dough-rising basket or brotformen will give your loaves a fantastic golden crust with lovely ring patterns. When risen, simply turn your dough over into a pan to bake. Brush off excess flour from the basket to clean and store it somewhere dry, away from odor, and you will keep making beautiful loaves for many years to come. SET INCLUDES: 1 dough proofing basket made of rattan, 1 cotton liner cloth, 1 plastic dough scraper, and 8 plastic cut-out stencils. ORGANIC MATERIAL: Made of natural rattan which draws away moisture from the dough while it is rising and will ultimately give it a fantastic crust. BAKE BEAUTIFUL BREAD: Give your loaf a beautiful coil pattern when you let your dough rise in a banneton proving basket before baking. Add some holiday flair to your final product with the included Christmas-themed stencils. MEASUREMENTS: Brotform proofing basket measures 8.75 x 3.5 x 8.75 inches.